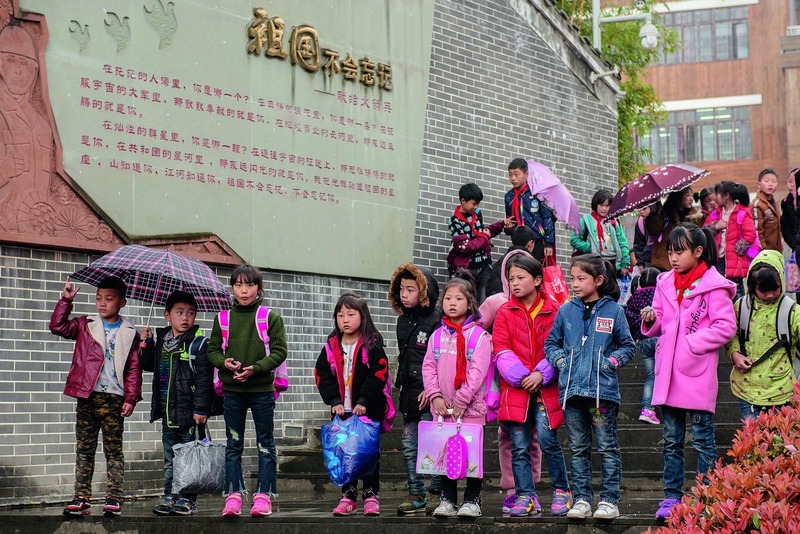 March 23, 2018: Students of Bayi Primary School head home after class in Wenchuan County, Sichuan Province. A decade ago, a devastating 8.0 magnitude earthquake rocked Sichuan Province, decimating several counties including Wenchuan and Beichuan. After ten years of reconstruction and poverty alleviation efforts, the quake-stricken areas now have a new look. China’s reform and opening up originated in rural areas with adjustment of the relationship between farmers and land. Before 1978, hundreds of millions of Chinese people were struggling to meet their basic daily needs. After 40 years of development, more than 700 million people in rural areas of China were lifted out of poverty. This not only laid a solid foundation for China to build a moderately prosperous society in all respects, but also made great contributions to poverty alleviation and development for all mankind. In 1978, farmers from 18 households in Xiaogang Village of Fengyang County, Anhui Province took the lead in signing a secret agreement to divide communal farmland into individual plots, which inadvertently gave birth to the household responsibility system and lit the torch for China’s rural reform. By breaking up the people’s commune system, removing many of the constraints of the planned economy and implementing the household responsibility system, farmers received contracted land they could freely decide what to grow, which greatly stimulated their enthusiasm for agricultural production. Rural reform laid a solid foundation for the country’s development in the next stage. From 1978 to 1985, the profound reform of China’s rural economic system provided a strong impetus for unconventional economic growth and dramatic reduction of the poverty-stricken population. According the standards at that time, 50 percent of the rural population in poverty met their basic needs during this period. And even according to the poverty alleviation standards updated in 2011, more than 100 million rural people were lifted out of poverty during the period. From the 1980s to the 1990s, township enterprises developed rapidly in the Yangtze River Delta and the Pearl River Delta, which brought tremendous influence to the development of China’s rural areas and greatly promoted the progress of national poverty alleviation. Thanks to rural reform and scientific and technological progress in agriculture, a huge number of rural laborers have been emancipated from the land. Many farmers set up township enterprises to become entrepreneurs, driving more villagers to work in town for considerably increased income. Many credit township enterprises with fueling a leap forward in the transformation of farmers to workers. To eliminate poverty, China promulgated and implemented the Seven-Year Priority Poverty Alleviation Program in 1994, which was designed to lift 80 million people out of absolute poverty through development-oriented poverty relief efforts in a period of seven years from 1994 to 2000. During the seven years after the program was implemented, the central government invested 124 billion yuan in poverty alleviation, and the rural poverty stricken population dropped from 80 million to 32 million. To improve basic production and living conditions and consolidate the achievements of meeting basic needs of people in poverty-stricken areas, from 2001 to 2010, China’s poverty alleviation policy narrowed its target from county level to village level and implemented the strategy of developing the whole village instead of individuals. In 2011, China launched the Outline for Development-Oriented Poverty Alleviation for China’s Rural Areas (2011-2020) and put forward new poverty alleviation goals and strategies. A dozen of contiguous poor areas were designated as the main battlefield for poverty alleviation and development, and the poverty alleviation standard was raised by 92 percent. According to the new standard, by the end of 2012, the number of people defined as living under the poverty line had risen to 98.99 million. Since the 18th National Congress of the Communist Party of China in 2012, China has comprehensively deepened reform in the field of poverty alleviation, innovated ideas, measures and institutional mechanisms, and established the basic strategy of target poverty relief, optimizing achievements in poverty alleviation in the country to levels never seen before. From 2013 to 2017, the poverty-stricken population in China’s rural areas was reduced from 98.99 million to 30.46 million, according to the current poverty alleviation standards, with average annual poverty reduction of 13.7 million people. A solid step has been taken to solve overall poverty in rural China. Living standards and quality have generally improved in rural areas of China, and even production and living conditions in the poorest areas have seen tremendous changes. Traffic problems have severely restricted rural economic development, but over the past several years, China has continued to invest heavily in infrastructure. By the end of 2017, 98.45 percent of towns and 96.87 percent of administrative villages in poverty-stricken areas had paved roads. And the proportion of administrative villages in poverty-stricken areas with access to electricity, telephones and television signals has increased to more than 98 percent. Social undertakings such as education and healthcare have also developed rapidly in those areas. The rate of illiteracy and semi-illiteracy has continued to decline, the completion rate of compulsory education has risen, and the quality of the labor force has improved significantly. Furthermore, due to the implementation of the new rural cooperative medical system and other systems, healthcare conditions and service capabilities have continued to increase in rural areas. According to the poverty alleviation standard of per capita annual net income of 2,300 yuan, the poverty-stricken population in rural China decreased from 770 million in 1978 to about 30 million in 2017, with more than 700 million people lifted out of poverty. According to the US$1.9 a day standard that the World Bank uses for global poverty monitoring, the global poverty-stricken population decreased by 1.1 billion during the period from 1981 to 2012, a drop of 55.1 percent. In contrast, the poverty-stricken population in China dropped by 790 million during the same period, accounting for 71.82 percent of the global number. China created a miracle in global poverty reduction history and contributed Chinese wisdom and a Chinese approach to global poverty alleviation undertakings. China’s sound national governance structure has ensured the in-depth promotion of national strategies, effective implementation of national policies and rapid economic and social development, which has been a core factor in China’s successful poverty reduction. China has set up special poverty alleviation organizations, integrated poverty alleviation and development into its national development strategy, formulated poverty alleviation strategies and plans, carried out poverty alleviation actions targeting specific groups of people, and promoted implementation of policies from top to grassroots level. Implementation efforts from the central government down to local governments have been strong and effective, reflecting sound governance capacity and good operational efficiency of the Chinese government as well as the advantages of the Chinese system. China considers targeted poverty alleviation an important measure to tackle key problems in poverty reduction work. It involves finding the root causes of poverty before prescribing a suitable remedy and delivering targeted treatment. The days of general poverty alleviation efforts have given way to a compound poverty alleviation governance system. Led by the government and focused on the poverty-stricken population as well as the grassroots rural communities, it has attracted enterprises, non-governmental organizations and volunteer groups to participate in poverty reduction efforts, which effectively promotes targeted poverty alleviation and helps achieve the goal of sound governance of poverty-stricken areas. Since its reform and opening up began in the late 1970s, China’s economy has maintained high-speed growth for a long time. Alongside letting some people get rich first, the country has also handled the issue of equity and development well by improving the social security system and subsidizing the poor with tools to escape poverty. The author is a research fellow at the Beijing-based Research Center for Xi Jinping Thought on Socialism with Chinese Characteristics for a New Era and a professor with the School of Agricultural Economics and Rural Development at Renmin University of China.